Whether you’re mastering social selling, making yourself easier for future employers and clients to find, or recruiting top talent, it pays to be a LinkedIn power user. But do you know how to be found on LinkedIn? The trick is in understanding how LinkedIn works and how you can take full advantage of the search algorithm. Searching LinkedIn is not much different than searching Google—SEO matters! It matters so much that it bleeds outside of LinkedIn and into Google. BrandYourself released findings that show LinkedIn is the social network most often appearing at the top of Google search results. A LinkedIn profile has an ever growing number of different sections, but LinkedIn’s Search algorithm weights some of these heavier than others. Keywords in your Name, Headline, Company Name, Job Title and Skills rank higher in the search results. In no particular order, let’s look at some of the criteria that LinkedIn uses when determining its search results. Your headline is the first thing people see in your profile, your first chance to make an impression. Although LinkedIn autopopulates it with your current title and company name, you can edit this headline at will. Show a bit of personality and set yourself apart. Just make sure you include key terms, as LinkedIn’s algorithm crawls your headline for search keywords. LinkedIn favours profiles that are 100% complete. This means that if you want to be taken seriously by LinkedIn’s search algorithm you must keep your profile complete and updated when LinkedIn adds new fields and options. You should approach this section of your LinkedIn profile with Jill Rowley’s ABCs in mind: Always be connecting. The search results returned to each and every person are unique to them in that it will display people in your network giving weight to how distant they are to you. This makes sense since the chances of you connecting to someone with a mutual contact are higher than your chances of connecting with a complete stranger. Put simply, the more contacts you have, the more likely you are to appear in searches by members of your extended network. Keyword searches will bring up the most relevant results among your connections first. LinkedIn allows you to choose up to 50 Skills. If you’ve selected anything less than 50, you’re putting yourself at a disadvantage. It seems simple, but the more relevant skills present on your profile, the most likely you are to appear in searches for those specific skills. Don’t be humble, share all of your skills and abilities. While making the most of each of these sections will help you rank better in search, it’s important that you don’t abuse LinkedIn’s algorithm. Spamming, misrepresenting your name or work history, and sending inappropriate messages whether publicly, via InMail, or in groups puts your profile at risk of being flagged. Once LinkedIn flags your profile, you will have a much harder time finding and connecting with those valuable prospects. 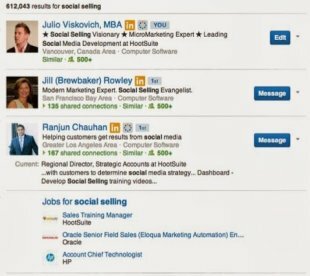 Did you know you could manage your LinkedIn profile or company page from your HootSuite dashboard. Find out more about our LinkedIn integration.